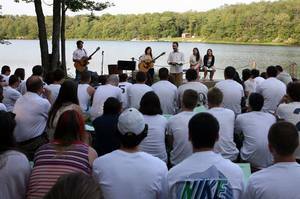 I've gotten to witness an incredible Shabbat tradition here at Camp Poyntelle Lewis Village! The entire camp dresses in white for a Friday-night Shabbat service, but the travel logistics are truly impressive. As Shabbat approaches, Lewis Village (the older camp, located at the far site) walks over together, singing a Shabbat song. Meanwhile, Camp Poyntelle (the younger camp) gathers by the lakeside, and the head counselor reads them a Shabbat story. When the older campers arrive, they say together, "Shabbat shalom, Poyntelle," to which the younger campers respond, "Shabbat shalom, Lewis!" They then walk together to CPLV's beautiful Shabbat Spot (pictured above), on the lake in front of the setting sun. Lively services and a delicious dinner close out the Shabbat experience. Part of this Shabbat tradition was newly created by this year's Cornerstone Fellows. At the Foundation for Jewish Camp's Cornerstone Fellowship conference, the fellows (all third-year counselors) learned how to more actively incorporate Judaism into camp life, and they also talked with other camps about effective techniques. This Shabbat ritual is one way that the Cornerstone Fellows are making Shabbat more accessible for CPLV's campers!